In a recent post, The Pull from the Future, I discussed how any sort of quantitative model based on statistics, earnings, GDP -- really any extrapolation of past data into the future -- is just not a viable method for forecasting future market behavior. Yet this is what everybody does when analyzing markets, as most people can’t even conceive of an alternative. Today we received one of the more startling examples of this type of analysis, courtesy of Goldman Sachs, arguably the world’s leading purveyor of the quantifiable data-driven approach to markets, at least outwardly. Behind the scenes it’s likely a different story. 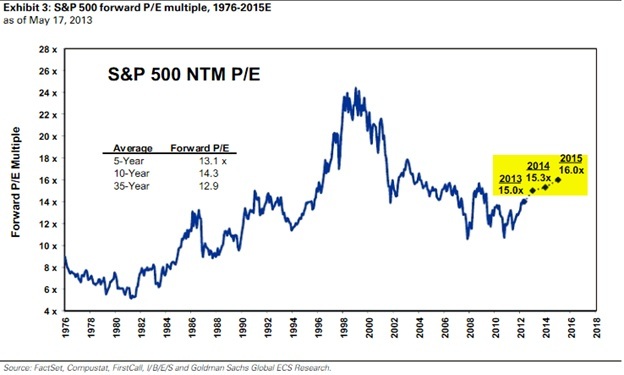 The bottom line is mighty Goldman Sachs thinks the S&P 500 Index is going to 1750 by year end 2013, to 1900 by 2014, and on up to 2100 by 2015, having arrived at these bullish conclusions through an amazing alchemical brew of quantitative extrapolation. Wow. That is really something. There is so much jargon in this one tiny excerpt that it barely reads as English -- and we have to pay close attention to jargon, as it is invariably the easy cloak for specious arguments. This is such a timely example of precisely I’m talking about – that when you set out to predict the future as something that is pushed from the past, ridiculous mental gymnastics can be performed to fit a pre-existing conclusion – in this case, that the SPX will be higher by 2015. In other words, forget all that stuff we just said, the market will go up because we think it will! This also underscores a more subtle point about why certain types of investors gravitate to the gold market, and other commodity markets. While there is still a cacophony of noise in these “hard asset” markets, it is at least mitigated by not having to put up with this type of ridiculous statistical engineering on future earnings and multiples. And thankfully, there are also no CEOs or Board of Directors routinely offering deceptive forward guidance. 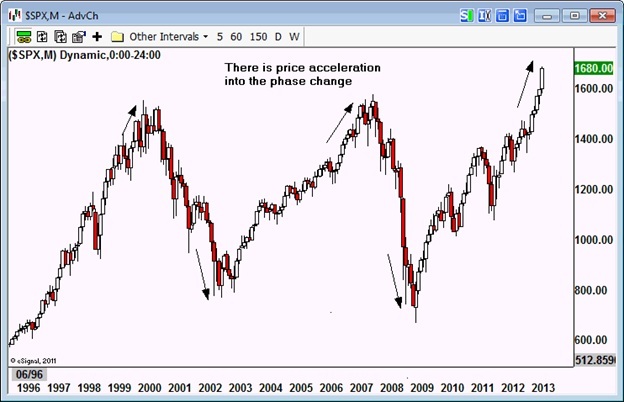 I also highlight this forecast because it is what we should expect to see as a market approaches an important top. Rising bullish sentiment near a peak always creates a desire to extrapolate the good times into the future. We’ve all done it at one time or another, to disastrous effect. But this time I’m advocating a new game-plan for the approaching top, with a different perspective on the current situation. I’m offering up the idea – researched and tested over decades, since the 1940s, and recently uncovered and thoroughly tested by me – that there is a measurable and quantifiable teleological pull on prices. Knowing about this pull from the future is the only way to have advance knowledge of future market conditions. Astonishingly, the large-brained individual who did the pioneering work on characterizing the market energy wave predicted there would be an enormous bubble in stocks in the late 1990s, followed by a crash from 2000 to 2003 – and this prediction was made in the 1960s! Because the structure of the market energy wave is a structure in time, its future indications can be laid out in advance, pointing to periods of change that can be anticipated and evaluated in terms of psychological and economic climate. Every phase of this energy wave is aiming for a specific point in time, at which point it immediately starts heading for the next end point. Right now this pull from the future is approaching the climactic moment for this long bullish phase that started at the March 2009 bottom. Indeed, we are seeing this pull became heightened as the attraction from the peak becomes more powerful with proximity. This upcoming phase change will have a profound effect on every market, in particular the stock market as the most sensitive barometer of how the masses of economic actors feel about the future. But this is also the point in the 36-year cycle when currencies and gold take center stage, as I discussed in my previous post, The Monetary Cycle and Gold ( http://www.gold-eagle.com/editorials_12/nichols050613.html ). If you are interested in learning more about the 36-year market energy wave, and the upcoming phase change, I have just released a free introductory report on my new web site, atwww.marketenergywaves.com .